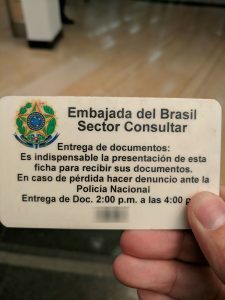 I had to visit the Brazil Embassy in Bogotá to submit my Canadian passport for a tourist visa. The process was relatively painless, however some “lost in translation” instructions made things a little more difficult than they needed to be. So, in English, here is the exact process if you need to do something similar. Of course, the official word on what you need and costs can be found on the Consulate General website. You will need to submit the following documents in order to get your visa. A print out of the form given to you after you fill out the necessary details online. A copy of your receipt/itinerary from an airline showing your inbound and outbound flights into and out of the country. A bank statement showing “sufficient funds” during your stay in the country. Your passport with an empty page free of any stamps or visas. You will need to bring the following in order to process your application. A form of ID (drivers licence, identity card) as collateral in exchange for a keycard to enter the building. Sufficient cash in Colombian Pesos for the application fee. For Canadians, that’s $308,000COP. The embassy is located on the 8th floor of a commercial office building. It is only open from 9am – 12pm for visa applications and 2pm – 4pm for document retrieval. So plan your trip accordingly. 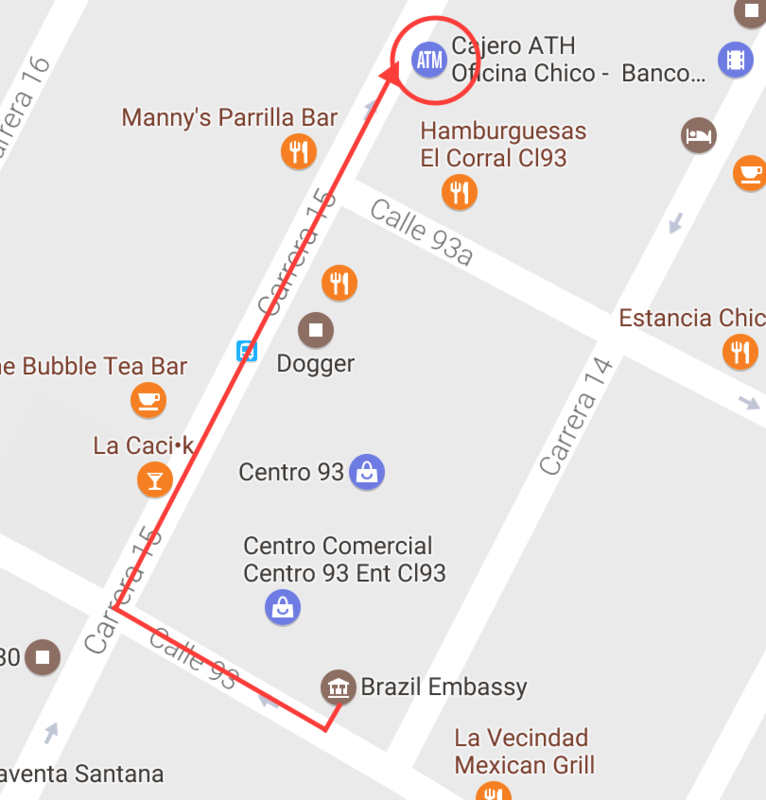 To enter the building, find the entrance located off of Calle 93. It will be the eastern most entrance on this street. When you enter, let the receptionist know you want to head to the embassy. She will ask you for a form of ID (don’t give her your passport) and in return you will get a keycard to go through the security gate. Use the card to enter the building, and use the elevators to get to the 8th floor. The elevator will dump you right into the embassy lobby. Let the receptionist behind the bullet proof glass know that you are here for a visa application. She will record your passport details and photo as an entry log. Go through the metal detector and the steel doors to the waiting area. Before sitting down, find the kiosk where you can grab a number. Be sure to press the “non-brazilian” button to get your number. Once your number is called, hand in all your documentation and your passport. If you require the use of your passport during this time, ask the official for a letter and a copy of your passport photo page. These two items can be used for domestic travel within the country. 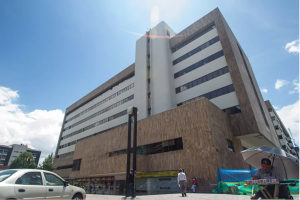 The official will file everything into a folder and give you a deposit slip for the Banco de Occidente around the corner. Take this slip and head back to the elevators. Use the same keycard to exit the security gate on the main floor and keep it. You will be coming back. Exit the building, turn right and head towards Carrera 15, then make another right. You are now walking north. Cross Calle 93a and on the right hand side you will see the bank (Banco de Occidente). You will have to write your name, telephone number, and passport number on the deposit slip before handing it over. Give the teller the completed slip and money. She will deposit the cash, give you your change, and give you a receipt. Time to head back to the embassy! Go back the way you came and back up to the 8th floor. It wasn’t busy when I arrived, so I went straight back to the same wicket that I handed all my information to and gave the official the deposit receipt. He then gave me a card with a number on it. Keep it safe! This is how you retrieve your passport and visa in 10 days. Translation: Retrieving your documents: Present this card to receive your documents. In case this card is found, return it to the National Police. Document Retrieval: 2pm – 4pm. Return downstairs and give the keycard to the receptionist to get your identification back.